of George Washington and the cherry tree. I’m not sure whether the story of the United States is still taught as if the presidents are stepping stones through history. That was the approach when we were growing up. The teachers marched us along through various administrations, inflicting names and dates that kept slipping away. Meanwhile, the presidents peered out from the pages of textbooks: “fools in old-style hats and coats” (to steal a line from Philip Larkin). We assumed that all presidents were smart, diligent, and honest, starting with George Washington who could not tell a lie after he chopped down the cherry tree. Thankfully, that assumption has disappeared. But still, it’s useful to organize our history around the, uh . . . guys. And there are a few interesting similarities between our president-elect and some of his predecessors. 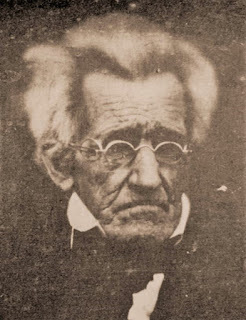 First is Andrew Jackson, to whom historians pointed even before Trump won the election. As candidates, both appealed strongly to the “common man.” White supremacy was a cornerstone of Jacksonian democracy. Like Trump, Andrew Jackson ignored precedent. As a general, he often acted against orders, behaving punitively toward soldiers. As president, he sent the Cherokees on a death march from Georgia, even though the Supreme Court had ruled they could stay on their land. He repeatedly violated the Constitution. Stubborn defiance of laws and formalities was just one of Jackson’s many awful traits. Four years after Jackson, in 1840, along came William Henry Harrison. He hailed from Vincennes, Indiana, on the Wabash River, where he lived in a mansion called Grouseland. College-educated and wealthy (his father had been governor of Virginia and signed the Declaration of Independence), Harrison ran for president as a man of the people. His campaign invoked “log cabin and hard cider” against the aloof incumbent Martin Van Buren. While “Matty Van” tried to be serious, Harrison – a war hero nicknamed “old Tip” – capitalized on slogans and drew thousands of fans to rallies. The vicious campaign culminated in Harrison trouncing Van Buren. By the way, Van Buren was a protégé of the awful President Jackson and unworthy of reelection. In February of 1841, 68-year old Harrison boarded a train to the capital city – the first time a president-elect arrived in Washington, D. C. not on horseback or in coach or carriage. His delicate wife, Anna, stayed at Grouseland and hoped to join her husband in a few months. In the meantime, her daughter-in-law would serve as White House hostess. The comparison must stop there, for the new president served a scant month, dying of pneumonia in the White House on April 4, 1841. The conventional wisdom is that he caught his death of cold while delivering a one-hour, 45-minute inaugural speech in a snowstorm. We can safely bet that Trump will not speak that long. Skip a few decades to the obscure Gilded Age president, Chester Alan Arthur of New York. 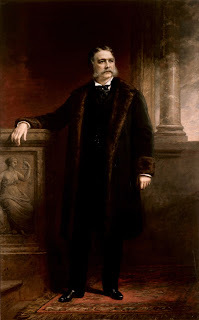 Adorned with mutton chops and dressed fastidiously in fancy suits, Arthur became president upon the death of James Garfield, who was assassinated by a frustrated job-seeker. A widower, President Arthur entered a White House in need of remodeling, which Garfield had initiated during the six months he served before being shot. Arthur, who adored opulence, became involved in the plans to redecorate the public rooms. With plenty of time on his hands, he took to pacing the first floor of the mansion, ordering minute modifications to his taste. Eventually, the project was finished. But Arthur did not like the result. He threw out everything and started over – this time with the designer Louis Comfort Tiffany by his side. Now the gas lit mansion would be reinvented with shimmering color and ornamental ironwork. The piece de resistance of Tiffany’s White House was a set of vast stained-glass screens in hues of red, white, and blue that greeted visitors in the main entry hall. The panels would cast an eerie iridescent light until Theodore Roosevelt banished them two decades later. The Republicans chose not to re-nominate President Arthur in 1884. The decision probably was unrelated to his obsession with luxurious décor. It’s tempting to mention President Warren Harding and his plundering cronies. But we’re not there yet. Stay tuned.